Saucony Breakthru 2 are neutral performance running shoes. The Saucony Breakthru 2 is the update of the model from the american brand to fill the position of a traditional performance shoe. It features a versatile blend of the conventional firmness and 8 mm drop from Ride 8 and the modern responsive lightness from the popular Kinvara 7. 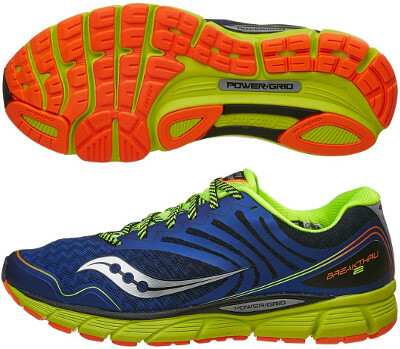 Unlike recent releases from Saucony, the Breakthru 2 still relies on PowerGrid™ foam instead of latest EVERUN trend. Basically only the upper has changed compared to Breakthru's first edition. There are no extra overlays over breathable mesh and synthetic overlays (FlexFilm™) feature not only lightweight structure support but also modern and attractive design. Typical Saucony brand logo has been moved forward and is the biggest reflective element in order to increase visibility under poor light conditions. Interior lining from both ankle collar and tongue are made of RunDry™ materials for great breathability and odour control resulting in optimal sanitation. Besides upper, everything remains almost the same in the Breakthru 2. Midsole cushioning relies on a full length PowerGrid™ platform on top of SSL (Saucony Super Light) EVA layer to provide a comfortable but responsive ride. Outsole includes several flex grooves for great flexibility to contribute to smooth transition and presents softer and lighter rubber (iBR+™) in the forefoot for elasticity and a firmer one (XT-900™) in frequent impact zones to assure better response and durability.